There are three ways to support this site. You can patronize one or more of our clients or you can make a direct donation an any amount you choose. The thrid way is to share memorabilia that we can post images of on the website. Please click here to see contributors and those clients and/or make a donation. Thank you. A work in progress, this site is an effort to preserve the history of Souther Field. You are invited to participate in the ongoing construction of this site if you have any material that would be appropriate. Also, if we have stated something incorrectly we would like to know. If you were trying to reach the website for Souther Field Aviation, Inc. click here. The following was taken from The Americus Times Recorder...An excerpt from a speech given by retired State Senator George Hooks on February 8, 2013 to the Americus Kiwanis Cub. "Souther Field. "The airport, now known as the Jimmy Carter Regional Airport," pointed out Hooks, "is not only where Lindbergh made his first solo flight and bought his first plane, it is the oldest, continually operated airport in the English-speaking world. There's not another (older) airport in North America or anywhere in Europe that speaks English. There's only one in France that equals Souther Field in age, 1916. Somebody in tourism, the City, County, the Chamber needs to play that up ... that would be a great tourist attraction. In my opinion, for these weekend fliers ... fly in and out of the oldest airport in the English-speaking world."" Souther Field is the current location of South Georgia Technical College. Souther Field airport is adjacent. 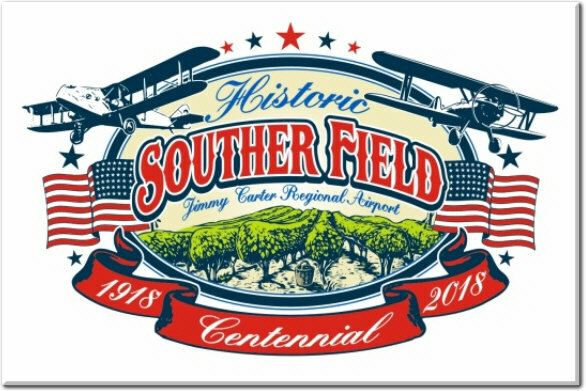 Click here for a Souther Field article in General Aviation News. Souther Field was named in memory of Henry J. Souther. Click here to learn more. Click here to help identify ladies that worked at Souther Field during WWII. NEW Click here for WWI Era 2nd Lieutenant David M. Suttle photos courtesy of his daughter Lori Armstrong. In 1917, Americus submitted its bid to provide an aviation camp to train pilots for the U.S. Army. Americus was later named as a location for a training camp for pilots and the contract for the construction of Souther Field was let on February 7, 1918. Work was begun on February 19th. The contract was let on the basis of cost plus 10 percent to J. B. McCrary Co. of Atlanta, GA and the Hardaway Construction Co. of Columbus, GA. In 1918, Souther Field gave more flying hours than any field in the entire country and had quarters for 2,000 cadets. During the years just after WWI was over, there were a lot of surplus aircraft available for purchase. In 1923 Charles Lindbergh bought one of the planes still in a wooden box and assembled it with the help of some locals. He soon made his first solo flight and as they say, "the rest is history." In 1929, Souther Field was purchased by Sumter County. But it was not until 1940 that reconstruction of the field began in preparation for a new cadet pilot school to train U.S. and British pilots. The training facility was operated by Graham Aviation. This continued through WWII. In 1946, Sumter County again took possession of Souther Field for use as a civil airport to be operated by Graham Aviation and offering flying instruction to anyone. 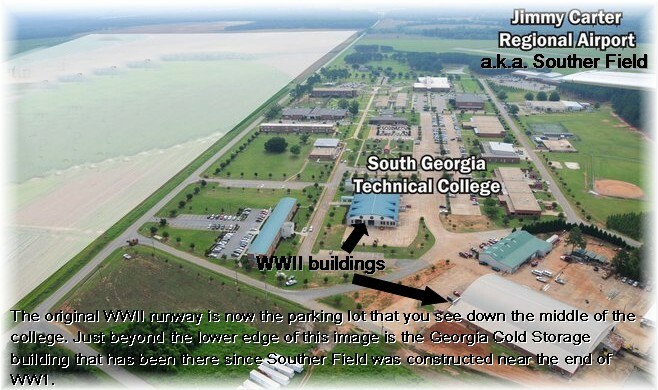 In 1948, South Georgia Trade and Vocational School (now South Georgia Technical College) was established on the historical campus. Some ten years later the local airport facility was relocated to the East of the original location and retained the historical name. In 2009, local officials made a decision to change the name of the facility to the Jimmy Carter Regional Airport. Mike is a local aviation historian, a friend and a contributor to this website. Click on the link below. The following articles are found in the South Georgia Historic Newspapers Archive and is presented online by the Digital Library of Georgia. Click on the following link http://sgnewspapers.galileo.usg.edu/sgnewspapers/search to search for other information that may be contained in South Georgia Newspapers 1845 - 1923. MORE TO BE ADDED. PLEASE CHECK BACK LATER. The following is a list compiled by Alan Anderson, of articles that have appeared in the Americus Times Recorder newspaper over the years. These can be found at The Lake Blackshear Regional Library in Americus. In the near future we hope to have each article posted on this site. "AT-R " Sept. 4, 1917 "AMERICUS HAS MADE BID FOR AVIATION CAMP;REPRESENTATIVE CRISP PRESENTS THIS CITY'S CLAIMS AND ADVANTAGES - OFFERS FAIR BUILDINGS "
"AT-R " Jan. 16, 1918 "AMERICUS NAMED AVIA___; EXPECT WORK TO COMMENCE IN FEW WEEKS; OFFICIAL ANNOUNCEMENT MADE TODAY THAT THIS CITY HAS BEEN AWARDED CAMP - TO BE READY APRIL FIRST "
"AT-R " Feb. 4, 1918 "OFFICIAL ANNOUNCEMENT IS MADE THAT BIG CAMP WILL BE LOCATED HERE; WORK TO START RIGHT AWAY; Mass Meeting at Court House Is Called For Tomorrow Afternoon - Business Men to Be Told Entire Details and Committees Names to Make Arrangements "
"AT-R " June 8, 1919 "PLANE TUMBLES INSIDE CITY, BUT FLYERS ESCAPE WITH FEW HURTS; Motor Goes Dead, According to Statement - Wife of Pilot Sees Accident "
"AT-R " Mar. 8, 1927 "SOUTHER FIELD GOES ___; 325 ACRES AND BUILDINGS BE SOLD APRIL 6; Quartermaster General Orders Sale of Flying Field Near Americus "
"AT-R " July 11, 1929 "SOUTHER FIELD IS BOUGHT BY COUNTY; Confirmation of Purchase Received In Telegram By County Board Today "
AT-R " Aug. 14, 1940 "SOUTHER FIELD AIRPORT PROPOSED; $274,653 ALLOTTED TO BUILD AIRPORT IN SUMTER COUNTY; SEEK SCHOOL FOR AVIATORS; Trying to Place Job Under U.S. Defense "
"AT-R " Nov. 19, 1940 "Reconstruction Of Souther Field Begun "
"AT-R " Dec. 17, 1940 "WORK BEGINS ON SOUTHER FIELD SCHOOL; Barracks And Mess Hall Going Up For School; SPEED WORK; Graham Air Classes To Begin Here Feb. 15 "
"AT-R " Feb. 26, 1941 "PROGRESS AT SOUTHER FIELD; Water, Hangar, Fields Are Solved "
"AT-R " Mar. 3, 1941 "CARS BANNED FROM FIELD; [... ] To Speed Work at Souther Field "
"AT-R " Aug. 3, 1944 "War Prisoners To Aid Harvest; Camp Will Be Located Near City "
"AT-R " Aug. 8, 1944 "Camp Will Be Ready Friday; Prisoners of War Due Here August 15 "
"AT-R " Aug. 15, 1944 "Prisoners Of War Arrive; 500 Germans And 92 Guards in Camp "
"AT-R " June 16, 1945 "R.F.C. ERECTING BUILDINGS AT SOUTHER FIELD; Work Started on Two Large Warehouses For Planes "
"AT-R " Dec. 22, 1945 "SOUTHER FIELD POW'S LEAVING; Saturday Is Last Day Prisoners To Work "
"AT-R " June 18, 1946 "W.J. GRAHAM WILL OPERATE AIRPORT; PLANS ANNOUNCED; County Gets Possession Of All Hangars, Administration Building And Machine Shop; Negotiating For All Other Buildings At The Field "
"AT-R " Sept. 9, 1946 "FLYING SCHOOL READY TO OPEN; Instruction Offered At Souther Field "
"AT-R " Aug. 12, 1947 "Berlin Woman Asks Local Office About Her POW Husband "
"AT-R " Jan. 10, 1959 " "Flipper " Files Given Newspaper "
"AT-R " May 15, 1961 "1,500 Attend Dedication Rites At Souther Field "